Commercial and industrial property owners can benefit from installing solar energy on business or factory roofs, or as ground-mounted systems on a commercial or industrial campus. Many corporations have massive manufacturing facilities with expansive flat roof space, and installing a solar array in that space can be a source of clean, inexpensive energy. The system size for the majority of commercial and industrial installations is usually substantially larger than a typical residential solar system. A commercial solar system can be up to several megawatts (MW) in size, depending on the amount of electricity the facility needs. Commercial solar is considered “distributed generation,” meaning that the energy produced by the system is used at or near the point of generation. Distributed generation projects such as rooftop or ground-mounted solar are usually connected to the local electric grid. 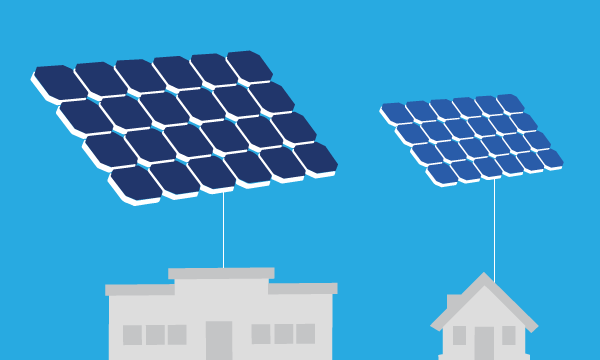 This allows for commercial property owners to take advantage of net metering, a policy enabling distributed generation customers to send unused electricity back to the grid for a monetary credit. What does a commercial or industrial solar installation look like? The solar panels used in commercial and industrial-scale installations are larger than residential panels. The typical commercial solar installation uses 96-cell or greater solar panels, meaning each panel is made of 96 or more individual solar photovoltaic cells. For comparison, a typical residential solar panel will have 60 or 72 cells. Commercial and industrial solar installations are usually installed on factory roof space, on large solar carports for parking lots, or as a ground-mounted array. More so than smaller rooftop systems, commercial and industrial solar systems include intricate racking systems to elevate and tilt the panels. Some commercial panel arrays even use racking with tracking capabilities, allowing the direction panels face to change and increase the amount of direct sunlight the panels receive. There are multiple rebates and incentives available for commercial solar installations. In addition to the 30 percent investment tax credit (ITC) that allows for the deduction of 30 percent of the cost of the solar energy system from federal taxes, commercial property owners can write off the value of their solar installation through the Modified Accelerated Cost Recovery System (MACRS). This incentive reduces businesses’ tax burden to speed up returns on solar investments. One of the best reasons to install a commercial or industrial solar panel system is the financial benefit. 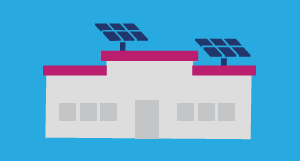 Offsetting some or all electricity use at a factory or small business with solar reduces electric bills from day one. Solar panel systems operate effectively for over 30 years, and once a business makes back the upfront investment for their system, they can generate free electricity from their panel system for many years after. Solar panels are a visible signal that the company installing them is committed to sustainability and a clean energy future. How companies and corporations are responding to environmental responsibility is an increasingly important issue; by taking action to support clean, renewable energy, companies can signal to potential customers that they care about more than just turning a profit. Installing solar is a great way to generate positive buzz with stakeholders and the local community. Many of the highest quality solar panel installation companies are local businesses, and contracting with them for a large commercial installation increases demand for high-quality, local labor. Additionally, the money spent on installation goes right into the local economy.